Bhishma Ekadashi, or Bheeshma Ekadasi, is observed in the Magha Month or Magha Masam (January – February). Bhishma Ekadashi 2019 date in India is February 16. It is observed mainly in South India, especially in Telangana, Andhra Pradesh and Karnataka. The popular belief is that the Vishnu Sahasranama Stotram (thousand names dedicated to Lord Vishnu) was revealed to the Pandavas on this day by Bhisma, the great grandfather in the Mahabharata. Bhishma was lying in a bed of arrows after the Great War in Mahabharat when he revealed the thousand names of Vishnu. 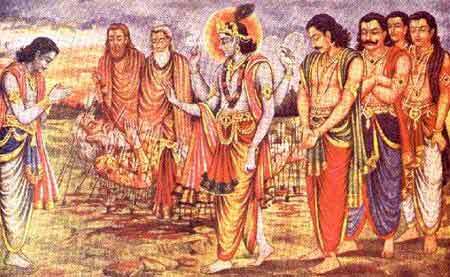 The Vishnu Sahasranama Stotram was revealed to Pandavas by Bhishma in the presence of Lord Krishna, who is an incarnation of Lord Vishnu. It is believed that listening to Vishnu Sahasranama Stotram leads to Moksha. It is believed that Bhishma chose this period to leave his body and merge with Brahman. Some of the dates associated with Bhishma during the period are of conflicting nature. As in a particular region, the Shradh for Bhishma is performed on an earlier date (Bhishma Ashtami) and the Ekadasi in a region happen later etc. The fasting that is kept on other Ekadasi is followed on this day too. Those observing partial fast avoid rice and grains. What to do on Bhishma Ekadasi day? Complete or partial fasting on the day. Those observing partial fasting can consume dry fruits, nuts, fruits, vegetables and dairy products. Rice and grains are completely avoided. Chanting Vishnu Sahasranama on the day is considered highly meritorious. Wear yellow color cloth while chanting the mantra. Offer yellow color sweet or fruit as prasad. Feed cows with yellow color banana.